Docker Review 2019: Is Docker a Good Hosting? Docker is a full-service website hosting provider based in Russia. They are primarily focused on their local customer base. Founded in 2003, Docker is a Russian website hosting company with nautical themes. Docker provides services to hundreds of customers in Russia out of a modern Tier III data center located in St. Petersburg. Their website and support are available in Russian only. Docker is a full-service website hosting provider. They offer shared hosting plans, virtual private servers, dedicated servers, and domain registration services. It’s clear that they’re serious about the quality of their technology, hardware, and data centers. Unlike most companies that don’t offer any information about their facilities, Docker has two detailed webpages on their website explaining the specifications of their data center, including photographs. They house their servers in a Tier III data center located in St. Petersburg, which means 99.9% uptime as well as dual-powered and fault-resistant equipment. However, this comes with a couple of caveats. Firstly, while they own their servers, these servers are colocated in a data center that’s owned and operated by a different company. This may mean slower response times in the event of any technical issues. Secondly and unfortunately, I could not find a Service Level Agreement on their website to back their 99.9% uptime guarantee. Further, on multiple occasions when I visited their website, it was labeled “Not Secure” by my browser, indicating that there wasn’t a private SSL certificate installed. This seems a rather big oversight for a web hosting company and also makes me question the security of websites hosted on their servers. Their prices are well within market range compared to other local and international companies. What’s more, when you purchase hosting from them, they give you a free domain registration that’s continually renewed as long as you stay with them, free website migration services, free protection against DDoS attacks, and a free CDN. However, they do not offer SSL certificates at all, even at an extra cost. Docker offers several different contract lengths, including month-to-month, quarterly, semi-annually, annually, biannually, and triannually. The longer the term, the greater the discount applied to your purchase, up to a maximum of 25% reduction in monthly fees. They also offer a seven-day free trial upon request; however, there is no money back guarantee or free plan available. An important pricing consideration is in regard to support. They offer free support — but with limits. Support is only available between 10AM and 7PM Moscow time, and only with certain tasks. If you require additional support outside of the scope of the free plan, there’ll be a monthly charge. That said, if you choose their highest support package, they’ll help you manage your servers to ensure security and performance, such as by performing weekly audits and software updates. Customer support is only available in Russian. There is a Russian phone number, email address, and Twitter channel. There’s no live chat available. This seems somewhat limited and it would be nice to see some form of support that enabled instantaneous responses from customer service; for example, live chat or Facebook messages. They do have a detailed resource center on their website, which is very helpful. 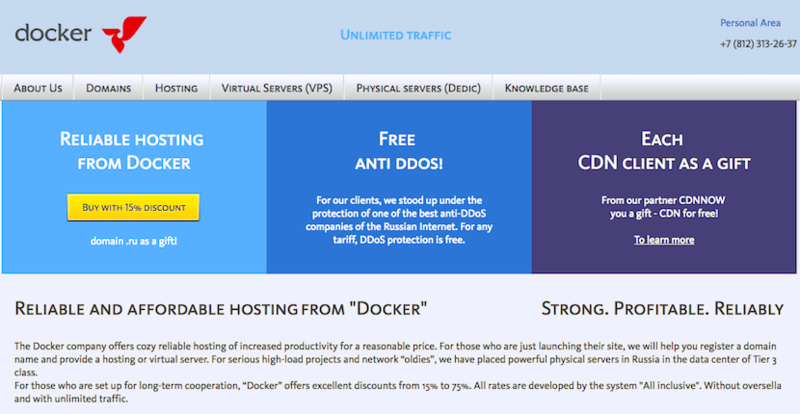 Docker provides affordable website hosting. Their plans include a lot of unlimited features, which will be helpful for webmasters who want a convenient web hosting solution. Wondering how Docker stacks up against other Web Hosting companies? Enter any other Web Hosting company and we will give you a side-by-side comparison.